Izaak Walton is famous for his fishing book The Compleat Angler (which has its 350th anniversary in 2003), for the cottage museum near Stafford that records his youth, and of course for his angling hours spent on the River Dove. 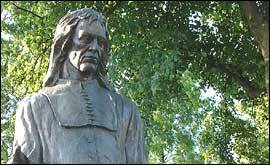 Izaak Walton, author of the world-famous book The Compleat Angler, was born in Stafford in 1593. Leaving the town to serve an apprenticeship in London, Walton had his own business as a linen draper in the city by 1624. The literary career began with a biography of the famous poet John Donne in 1640. Izaak's aptitude for writing led to four more highly acclaimed biographies. The series was interrupted by the turmoil of the Civil War. Walton, being a strong supporter of both the Anglican church and the Royalist cause, was forced to sell his business in 1644 and move from the Parliamentarian-controlled City of London to the quieter suburb of Clerkenwell. It was in 1653 that Izaak wrote the book that was destined to become one of the most loved and reprinted books in the English language. The Compleat Angler is of course a book on fishing but it is also a window in to seventeenth century country life. Two years later Walton purchased Halfhead Farm in Shallowford, five miles from Stafford. This property remained in his possession for the rest of his life and today its half-timbered cottage serves as a museum commemorating its famous owner.